Of the best sports books I have read in 2018, three were on rugby and the rest were in golf and soccer. I know you will enjoy them equally as much. The last England manager to come out with an autobiography was Stuart Lancaster, just before RWC 2015. Unfortunately for him, his team tanked at that World Cup, becoming the first host nation to fail to qualify from the group stages. There is no chance, then, of current England manager Eddie Jones tempting fate by doing the same thing. However, veteran Australian journalist Mike Colman has done one for him nevertheless with this entertaining read. Eddie Jones, for the uninitiated, is one of rugby union’s most interesting characters. A smart, fiery and dogged player in his playing days, he has brought those attributes to his coaching career, which has proved to be substantially more illustrious. He was the first Australian coach to win a Super Rugby title (with the Brumbies in 2001). He led the Wallabies to the 2003 Rugby World Cup final, knocking out perennial favourites New Zealand in the semifinal. And he was consultant coach to South Africa when they won the 2007 World Cup. He then coached Japan to the greatest rugby upset of all time, with their win over two-time World Champions, South Africa, at the 2015 RWC. That win, and Japan’s overall performance, prompted the England rugby union to ask him to take over from Lancaster. Jones’ most famous qualities, aside from his quick wit, innovativeness, attention to detail and work ethic, are his intensity and fiery temper. It is a temper that scares the living daylights out of full-grown, massive men — one of his most famous press conferences, after an early game as Japan’s coach, has become the stuff of legend. However, a stroke he suffered in 2013 while he was with Japan forced him to slow down; and the Eddie Jones you see now is actually a more mellow version. While authorised biographies typically gives previously untold stories or facts, they can also suffer from self-censorship or a sanitised retelling of events. On the other hand, biographies reliant on reported events, eyewitness accounts and countless interviews can often tell a picture that includes the parts the subject doesn’t want told. Rugby Maverick falls somewhere in between. Colman initially approached Jones to write an authorised biography, but Jones’ schedule meant this was not possible. Colman pressed ahead anyway and the result is a thorough job told at a cracking pace. The early part of the book alone was instructive of the kind of man Jones was to become. It covered his days in school — where he first met the legendary Ella brothers in preschool — and club rugby. His vicious sledging, attention to detail and work ethic were all evident in his early life; and have become a hallmark of his coaching career. Two earth-shattering rejections — not chosen for the Australian Schoolboys team and then the Wallabies — probably became the spur that drove him on, and still drives him, as his current charges, the England team and his staff, will attest. In any case, Jones is a very interesting subject to cover and to read about. He has climbed the highest heights while also experiencing humiliating lows, such as a stint with the Queensland Reds that lasted only a season. 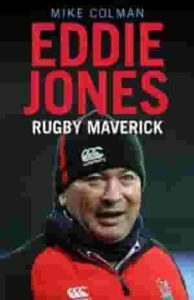 All in all, Rugby Maverick is a good primer on Jones if you know nothing about him. But it is also surprisingly informative if you think you already know him well. I have reviewed The Jersey elsewhere on forwardandback.com and you can read it here. In brief, this book tries to explain what it means to play for the All Blacks and delves into the mythology behind the jersey. A bit of history starts off the fascinating journey, because this is something that is intertwined with almost the whole existence of New Zealand. Bills also covers various aspects of Kiwi life, such as the World Wars, its schools system, and the impact of its Polynesian neighbours. He also speaks to most of the biggest names in Kiwi rugby history, along with many of their toughest and most respected opponents — such as Willie John McBride, Tony Ward, Alan Jones, Bob Dwyer, Nick Farr-Jones, Joel Stransky, Pierre Berbizier, Nick Mallet, John Eales and Victor Matfield. Definitely worth reading if you want to gain an insight into what makes New Zealand rugby one of the greatest success stories in world sports. Rare is the rugby book that has as its setting one of the Tier 2 nations. Sevens Heaven is worth reading just for that alone. But it is also an illuminating look inside one of the rugby countries of the world. For if nothing else, Fiji does lead the world in its production of some of the finest sevens players of all time. It is also a story of culture clashes: Ryan, an Englishman who grew up in rugby-playing schools, had never been to Fiji but, disillusioned with the way things were run at home, decided to take up an offer to coach in the South Pacific. There is also the cultural clash of someone who was used to professional sports suddenly thrown in at the deep end of amateurism, and local politics — especially the huge shadow of Fiji’s strongman Frank Bainimarama hovering nearby at every turn. As anyone knows, the raw talent in Fiji has always been there. What Ryan was surprised to discover is that some of the basics that sportsmen elsewhere take for granted, such as awareness of basic nutrition, are barely evident in the country. The players are prone to eating fatty foods, and especially foods and drinks containing huge amounts of sugar. You would never have guessed it, too, but many of Fiji’s players were also lacking in knowledge of the fitness training required to take them to the top. Ryan went about fixing all that: he bans sweet drinks and foods except as the occasional reward, and works on fitness schedules and a systematic training regime. He even takes his players to the dentist to fix some long overdue and neglected dental problems that many were having. And speaking of taking them to the top, Ryan also made full use of some of the most impressive sand dunes in the country, at Sigatoka, by getting the players to run to the top in exhaustive punishing sessions that ended with bodies “strewn around like they’d been dropped from the skies“. One of the biggest questions whenever a coach takes on a job in a culturally different country is whether the coach should adapt to the country or the country should adapt to the coach. But he also meets them more than halfway by immersing himself in local ways, making allowances for players who are vastly different from him. The result is a winning combination that wins his adopted country its first Olympic medal, and a gold to boot, cementing his place in the nation’s hearts forever. Sevens Heaven is an engaging and enjoyable read. Set amid exotic backdrops such as the Caribbean islands and the Kremlin, Red Card is a gripping read into one of the biggest sporting scandals of modern sport: the corruption surrounding world soccer governing body FIFA. Soon to be made into a film, Red Card is written by BuzzFeed investigative journalist Ken Bensinger. Bensinger has come up with an explosive expose of the rampant illegality associated with the world s biggest sporting organisation. 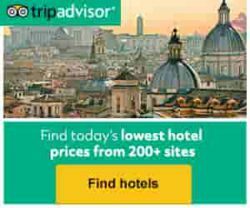 While their top product, the FIFA World Cup, has indeed been an unqualified success in delivering a sporting spectacle enjoyed not just by the avid fan but also practically everyone who enjoys a sports contest, it has also proved to be a path to riches for the men running the show behind the scenes. A large part of that comes in the high-stakes game of winning the right to host the event. And bribery and kickbacks are the chips at play. While there have long been rumours about the rampant corruption — in fact, some would say it was going on with impunity — action finally came when the United States’ Federal Bureau of Investigation led a crackdown on the racketeering, money laundering and fraud that had run unchecked among the officials of FIFA. That it was the Americans that ran the show in controlling the FIFA miscreants was not lost on most people. Some may even have seen it as the world’s wealthiest country bringing down a major sport that it was not that good at. Indeed, in America, the subheading of the book’s title was ‘How the U.S. Blew the Whistle on the World’s Biggest Sports Scandal‘. Tiger Woods must be one of the most famous people on earth — even now, when his best playing years and unblemished reputation seem to be far behind him. Millions of words must have been written about the champion golfer, who at his peak was arguably the top sportsman on earth, both in terms of achievement and in earnings on and off the course. Fans and those who followed him in his glory years probably think they know all there is to know about him already. But New York Times journalists Jeff Benedict and Armen Keteyian have come out with a biography that takes things several steps further. After reading everything that has been written about Woods, including transcripts of all his press interviews, Benedict and Keteyian then also interviewed 250 people, many of whom had never spoken publicly about Woods before. The result is a thorough and in-depth biography that doesn’t pull its punches on all the highs and the many lows of Woods’ life. 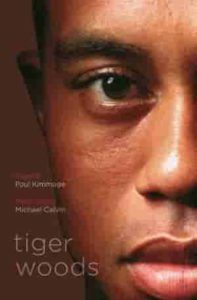 A large part of the book covers the only child upbringing and Tiger Woods’ relationship with his parents (former Green Beret Earl and his Thai wife, Tida). These provide more than a little insight into the kind of sportsman and person he became: competitive, ruthless and cold. They also provide a background to understanding the scandals that eventually enveloped him and led to his fall from grace. It is, at many moments, ultimately sad. But while the authors may have intended Tiger Woods to be a career obituary for one of sports’ fallen idols, Woods’ recent return to form has meant that the book is a timely and extremely readable biography for the second act of one of the greatest golfers of all time. This story has some legs in it yet. And of the five books mentioned here, this would be my #1 of the best new sports books I’ve read in 2018. In the span of my lifetime, I have enjoyed a vast array of sports biographies. This website is my attempt to review some of the best sports books I’ve read. 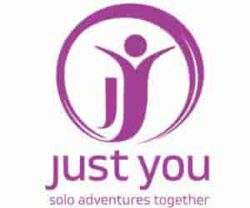 Feel free to browse through our category and see if there are any titles you would care to comment on. Hi! Thank you very much for this interesting selection of books! Eddie Jones has always had an interesting personality. His days as a player were characterized by his fiery temper. And now as a coach, he has enhanced it. That interview you included in this post, when he was coaching the Japanese rugby team, has really been emblematic. And Tiger Woods has really a sad story. But there are still many things that his downfall can teach to all of us. I suspect Tiger Woods’s story is not over. He has had a downfall but he could also have a second coming. I wouldn’t put it past him to win another major. As for Eddie Jones, I suspect he could finally win a Rugby World Cup. He won in 2007 with South Africa but he wasn’t the main coach but a consultant. His England team are good enough to do it, and Jones has inside knowledge of Japan, which is hosting the tournament. He has already picked the site that he thinks is the best place in Japan to prepare a team; the same one he used for his Japan team in 2015. I wonder what venue the Japanese team themselves will have to go to now! I’ll buy the one about FIFA corruption. I’ve been involved on football (as we call it in Europe, not soccer) and it’s really a shame how it’s controlled internationally. One of the biggest non-transparent organizations in the World. Directed by corrupt and arrogant individuals, that even threaten governments if they try to rule ‘against’ FIFA member Federations. 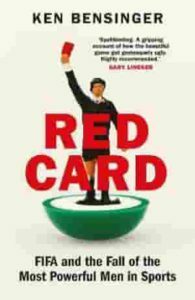 I know quite a lot about it, but sure I’ll find more interesting information on Red Card book. I’d be interested to know your thoughts on Red Card. In fact, feel free to expand on the FIFA scandal — perhaps in an article we would be happy to publish on our website. Let us know if you’re interested. I am interested in the last two book in this review, “Red Card” and “Tiger Woods.” I agree that with Tiger’s recent return will make this book a more interesting read but I don’t think it will be received that way. For the author’s part, I’m afraid this book’s sales will suffer because of it. Either way. I love celebrity biographies and I hope this book about Tiger Woods is no exception! Red Card, on the other hand, interests me because of the scandal made world wide news and I find that true stories about corruption contain within them lessons for life and enlighten me in the way that I must be vigilant to see what’s going on around me. The FIFA scandal(s) have shone a light on the corruption that we all have known to exist in sports. Are there any books that you’d recommend on the subject of scandal within Olympic sport and competition? Thank you for reviewing these books! I’m going to share this link with my wife and put these books on my Christmas list. The Tiger Woods book is exceptionally well researched and written. Definitely worth reading, especially as it exposes his warts and all (unlike many books on Woods). The FIFA book is also interesting and gripping. The best expose on the international Olympics Committee which went through scandals very similar to the one FIFA went through, was The Lords of the Rings by Andrew Jennings (great title! ), which came out in the early 1990s and was later updated. Jennings also wrote a book on the FIFA scandal called The Dirty Game. Another book on the Olympics itself, including some of its dark history, is The Games: A Global History of the Olympics by David Goldblatt. I am so glad that I had the opportunity to read your post about the best sports books of 2018. Initially, I wanted to read this so that I could get some ideas of how to do book reviews for my little used book shop’s website that I am slowly working on. Aside from horse racing, I simply have not had time to read many books in the sports genre. However, after reading your reviews, which are excellent by the way, I will most likely end up reading almost all of these suggestions. The biggest challenge is going to be figuring out which one to start with. Even though I know almost nothing about rugby, other than my ex-husband played it in his college days, Seven Heaven will likely be the first or second choice. I am eager to learn more about how a coach from a more affluent country was able to work with the raw talent of the athletes in Fiji. As you pointed out, we take so much for granted like good nutrition and physical training. I am interested to see how he was able to be non-compromising in what it took to develop the men into the best athletes they could be while still learning to successful adapt to their culture without completely alienating everyone in Fiji. At the moment, the book about Tiger Woods is the one rivaling my first read from this choice. As you mentioned, it is timely because as current events has shown, Tiger Woods is a winner. We are not reading the obituary of his sports career. From what you said, I feel like this book will give us a glimpse into a winner’s mindset. I am hoping it will provide a glimpse of what it takes to truly believe in yourself, to succeed wildly, to fail embarrassingly and then to get back up and keep going despite what others think. I wish you the very best in your used books website. I always support independent vendors of books as their real love of books shines through. In writing a review, whether you liked the book or not, you’ll often find that the words just flow out to your fingertips. In fact, it’s fun writing up a book review on one you particularly did not like! So you’ll do a fine job. Yes, the Tiger Woods and Sevens Heaven are good choices. They’re both informative besides being enjoyable reads. When I first stumbled across your article, I wasn’t sure if you were going in the direction of ‘sports book for betting’ or ‘sports books that you can read’. I’m glad you chose the latter. One of my all-time favorite sports books is Junction Boys, the story of ‘How Ten Days in Hell with Bear Bryant Forged a Championship Team’. Have you ever read that one? The book you included that caught my attention most was The Jersey. I think it would be really interesting to gain some insight into what it’s like to play for that rugby side. Thanks for taking the time to write up this review! Thanks, Tucker, for that recommendation. I’ve not read The Junction Boys but have looked it up and it looks interesting. I will have a go at reading the book; which I think is similar to Sevens Heaven in how a coach galvanises a group to achieve greater things through sheer punishing hard work. Thanks also for the pointer on “sports books”. Yes, that seems to be a phrase used in the US to mean betting on sports – something I know nothing about! Thanks so much for this article i love it so much it is really informative, I have always been a sports lover especially rugby. To me Eddie jones is one of the most talented rugby player to have ever grace the pitch seeing him in those days bring great joy to my heart. He was both capable as a player and as a coach, he redefine the game to me he will always be one of the game best. Thank you so much for this article it was really entertaining. I watched Eddie Jones play only once, and Jones himself has said he wouldn’t have selected him if he was the coach. I think Jones will prove a much better coach than player. I like sports, I watch NBA and football, rugby and golf not so much, but I think that those games are creative on their own way. I would maybe read ’Tiger Woods’ because his is a successful golfer, but there also negative parts and as I see there are many more in this book. ’Sevens Heaven’ seem as positive, motivational book. The way you described it sounds promising and worth reading. Yes, the Tiger Woods book is a good choice. I rated it my #1 of the best sports books I’ve read 2018. I’m afraid I do not read much basketball biographies. Reason being a multitude of them come out with biographies when their story is still largely not done (that is, they’re still at the peak of their careers and there would still be a bit more yet to happen). But there was a chess title that came out last month that I wanted to check out: Better Thinking, Better Chess by grandmaster Joel Benjamin. I’m not much of a chess player but the synopsis of this alluded to training mental techniques that intrigued me. Mental techniques that I believe will translate well across to most sports. I like the title of this chess book and the description. You’re welcome. Hope you enjoy them! These certainly sound like they would be great books for those of us who love the game—any game! Perhaps it is more that we just love the competition. Wow! Eddie Jones sure does have a fiery temper! I think this book will be a super good read! I don’t know Jones very well, but I am looking forward to reading about his life, his drive and his determination. I also think The Jersey will be a good read as I am very interested in New Zealand and plan to visit there in the near future! This can give me a kind of heads up as I go to see some rugby played. 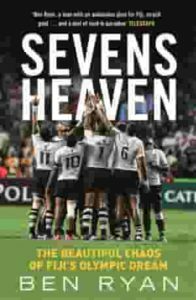 Sevens Heaven just sounds like it will be an overall great read as does Red Card. I am also looking forward to reading Tiger Woods. I was so disappointed when the scandal broke out. I would like to understand more about this young man and his comeback. Which book was your favorite? What did you like best about it? Thanks for the great review of the books. I will be sharing your site with my other sports loving friends! I enjoyed reading Sevens Heaven because it was an uplifting and eye-opening story, and was of a country and culture that is not often written about, Fiji. But if I had to choose which book was best, I would say it was the Tiger Woods book. This was a well researched book about triumph and tragedy, and was at times like watching a car crash as someone who was so famous and visible basically imploded before our eyes.